"Base hits, they knew, were a matter of feet. Double Plays were a matter of inches." 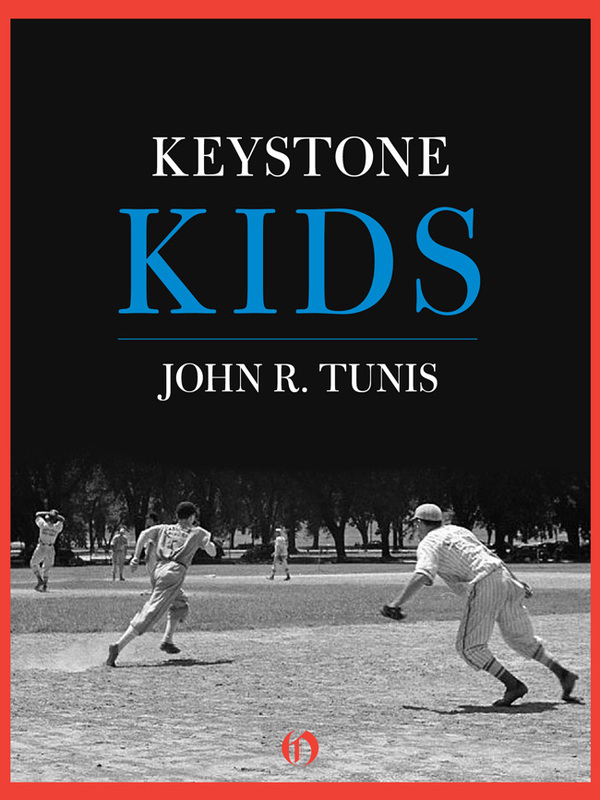 The first time I tried to read John Tunis' 1943 novel Keystone Kids, I was maybe seven-years-old. The book is about two brothers who play shortstop and second base for a minor league team in Nashville. Second base was sometimes called the "keystone" base. The boys, Spike and Bob Russell, work in perfect tandem while turning double plays and become known as the Keystone Kids. Anyway, I didn't finish it at that time. Not that it was too difficult for me. I was as brilliant then as I am now and often read above my grade level. But early in the book, the Kids are called up to play with the Brooklyn Dodgers. There's a scene in a train dining car where its explained to them that they can just sign the check for their meals and don't have to themselves pay. To my seven-year-old mind, that made adult life seem frighteningly complicated, so I gave up on the book. At least, that's the way I remember it. It's a pretty good story, so I'm just going to run with it. But, whatever my reason for leaving Keystone Kids unfinished, I did not choose wisely. Like all of Tunis' sports books, it's a wonderfully exciting story. 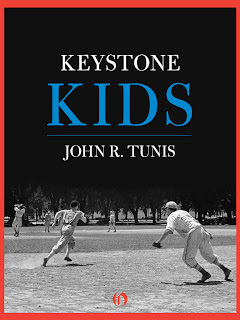 Kids is actually the third of eight books Tunis wrote about a fictionalized version of the Dodgers, with many of the same characters appearing throughout the series. This one introduces us to Spike and Bob for the first time. The Dodgers are having a rotten year when they first come up, though the two of them field and hit well. They get a better contract when they return for the next year, but the team is divided into cliques and factions that keep them from playing effectively. When the Dodgers hit last place, Spike is surprised to find he's been made manager. Despite his youth, the team owner appreciates Spike's intelligence and determination to win. At first, he brings the team together and they win a couple of games. But then the rookie catcher gets on the bad side of a veteran outfielder. And that's bad--because the young catcher is Jewish. Soon, he's the target of antisemitic taunts from both his teammates and from the players on other teams. His play begins to suffer and the team once again loses cohesiveness and begins to drop games. Spike wants the players to lay off, but even his brother Bob takes sides against the catcher. It's here that the book goes from being fun to being downright fascinating. Throughout the book, Tunis give us solid characterizations and play-by-play description of games that builds up a remarkable level of tension. But now, all of a sudden, the story is dealing with prejudice and its effect on a young, scared rookie. All of a sudden, baseball is a backdrop for deeper issues. Four years before Jackie Robinson broke the color barrier in baseball, John Tunis was already showing us that the game could be an important part of making the United States a true melting pot. 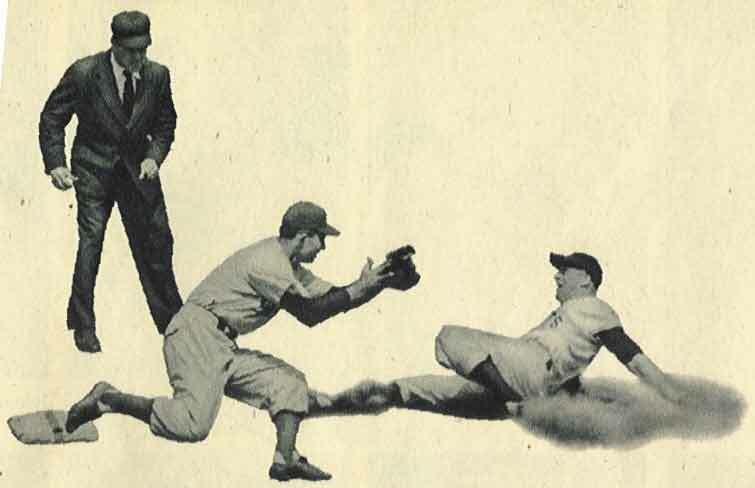 "The ball was to Spike's right, the hardest ball the shortstop has to handle, the test of a great infielder. It all had to be done fast, too, the stop, the recovery, the throw. He got down to it and stayed down the way older men never could; he went down and nailed the ball. Picking it up from the ground and throwing it was one continuous motion, a quick underhanded snap which Bob from years of experience timed perfectly." Baseball is the greatest sport of all time. As Earl Weaver once said: You can't sit on a lead and run a few plays into the line and just kill the clock. You've got to throw the ball over the plate and give the other man his chance. That's why baseball is the greatest game of them all. For that matter, let's quote Leo Durocher: I'd trip my mother. I'll help her up, brush her off, tell her I'm sorry. But mother don't make it to third. Actually, let's not quote Leo after all. Who let Luthor into the prison workshop AGAIN? A look at Superman's Rogue's Gallery should start with Lex Luthor. And Luthor plays an important part in this story. But Brainiac's origin story overlapped with our look at Kandor, so we'll finish up with him before moving on to the big bad baldie. Luthor discovers this after his latest jail break. A jail break he manages because he was able to smuggle stuff out of the prison workshop. Who let Lex Luthor into the prison workshop? Never let Lex Luthor into the prison workshop. It's just not a good idea. It's something that really ought to be spelled out very clearly in any prison warden's How-To guide. Anyway, after he fails in another attempt to kill the Man of Steel, he realizes he needs an ally. So he uses a space-time mental scanner to look for a likely candidate. This is the Macguffin that writer Edmond Hamilton uses to recount Brainiac's true origin. (The DC Wiki, by the way, lists Cary Bates as a co-writer.) He was created by the computer tyrants that once ruled an alien world--made to look humanoid so he could spy out other worlds to conquer. Eventually, the computer tyrants were overthrown and destroyed, leaving Brainiac the only surviving member of his mechanical race. It's a great origin, though it directly contradicts several aspects of the original story. 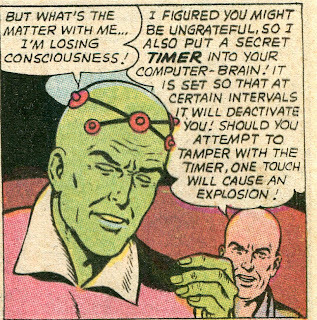 It also comes up with a weak reason for justifying Brainiac 5's existence--that member of the Legion of Super Heroes was supposedly a descendant of the original Brainiac. 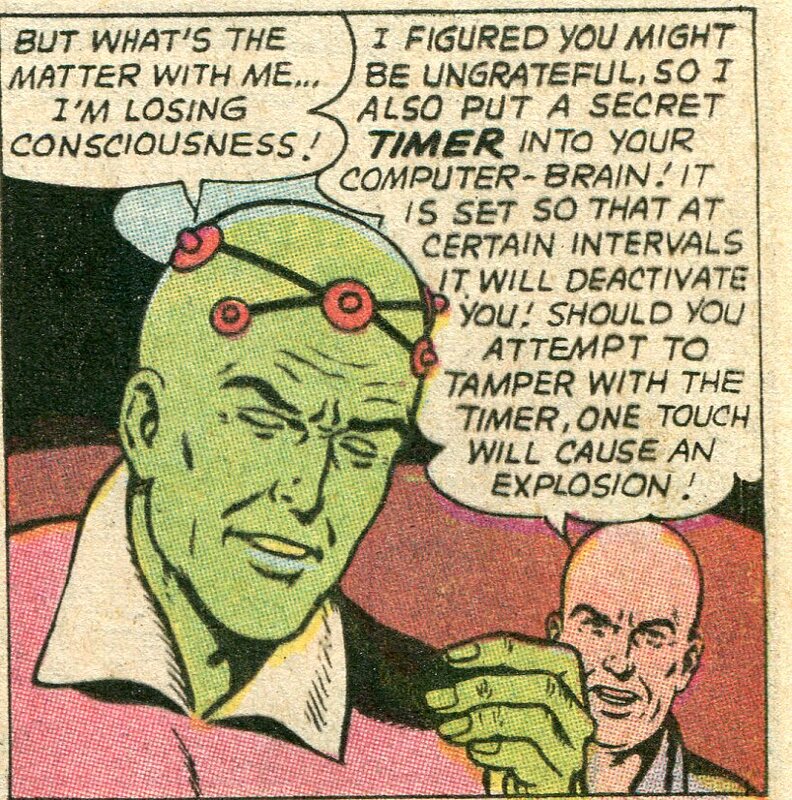 This no longer makes sense, so it turns out that a young man (renamed Brainiac II) was forced to join up with Brainiac to "enchance his human disguise." 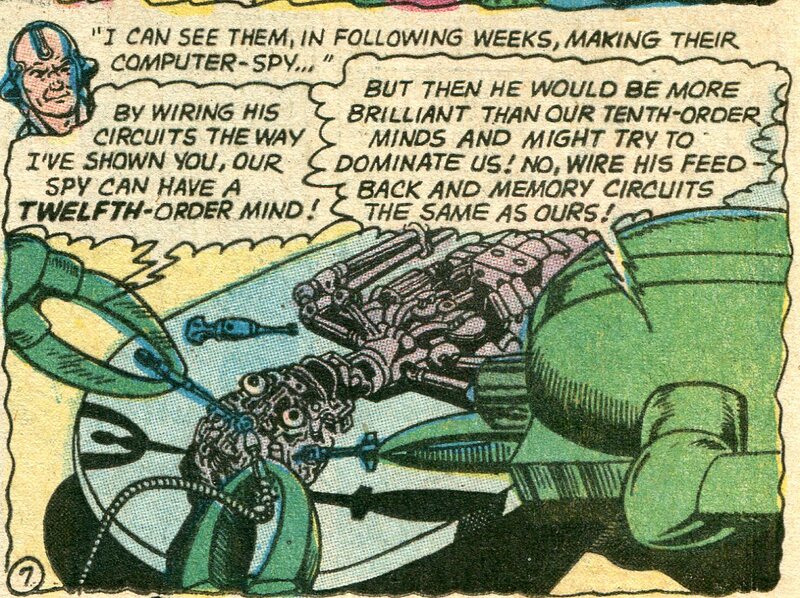 The kid escapes, keeps the name Brainiac for no good reason at all, and becomes the true ancestor of Brainiac 5. That aspect of the retcon is about as contrived as you can get, but I'm okay with it. 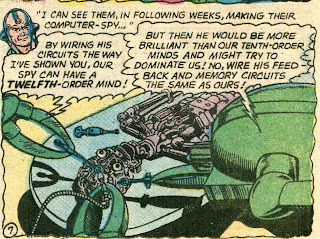 The retcon as a whole--making Brainiac a computer rather than a living being--gave him a uniqueness that enhances his already nifty visual design. The contradiction of past details is justified by the retcon's overall coolness. That brings up the subject of how important a coherent continuity should be in a fictional universe. I'm a firm believer that continuity is important. A fictional universe has to have a definable history and a consistent internal logic. Otherwise, the suspension of disbelief snaps and the foundation for good storytelling is lost. But we can't be completely dogmatic in this point-of-view. Sometimes, you have to ignore something simply because it was a just-plain bad idea. It becomes dis-continuity later on because that is simply preferable to acknowledging its existence. In this case, though, there was no need to ignore a bad idea. Brainiac was, rather, a strong edition to Superman's Rogue's Gallery. His visual design and his shrink ray combined to make him memorable. Which is why he started to make return appearances, even though his first adventure was constructed so that it looked as if Brainiac was meant to be a one-shot villain. That meant he eventually needed a strong origin story. Hamilton gives us that--so it's easy to forgive a few continuity glitches. So continuity is important, but violating continuity can be excused if the story is good enough. Of course, whether or not the story is good enough is a matter of personal opinion. But since my opinion is clearly more important than everyone else's, we'll just go with it. Which finally brings us back to the story, which progresses with Hamilton's usual flair for wonderfully bizarre story construction. Brainiac is currently a prisoner on an alien world. 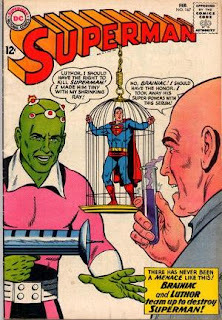 Luthor has to think his way past the various traps and safeguards Superman installed to keep anyone from springing Brainiac. The two team up, but plot to double-cross each other almost as much as they plot to kill Superman. They do manage to keep from killing each other long enough to trap their arch-enemy, strip him of his powers and shrink him down. But Superman without his powers can still think--he's soon free long enough to signal Kandor that he needs help. 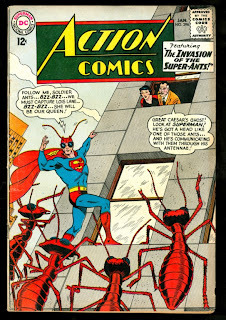 The Superman Emergency Squad pulls off a last-minute rescue, though they are forced to allow the villains to go free in exchange for bringing Superman out of a coma and returning him to full size and power. The story not only gives Brainiac more "personality"--making him more than just another evil alien--it's also a darn good story. Like the other Superman stories we've looked at in our tour of the Weisinger Era, it flows along from one plot twist to another without ever violating the bizarre but consistent internal logic of Superman's universe. Artist Curt Swan gives the whole thing a proper backbone with his strong and imaginative art. You can, by the way, read this story online HERE. Next time, we'll take a closer look at Lex, examining how his feud with Superman began and taking a look at what I believe to be the single best Lex Luthor story ever written. This is an eye-catching cover for a classic hard-boiled novel. 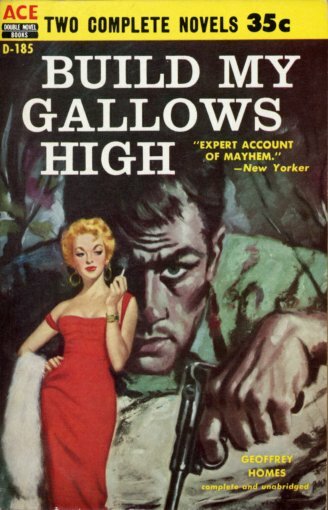 This novel, by the way, was the basis for one of the best-ever noir films: Out of the Past. Jackie Kelk is best remembered by OTR fans as Jimmy Olsen on Superman and as Henry Aldritch’s goofy teenage sidekick. But here he does an extraordinary job as a man who commits what he thinks is the perfect murder. But his own conscious and a mysterious shadow that keeps appearing on his bedroom wall might just be his undoing. The 1942 version of Rex Beach's novel The Spoilers (written in 1906) is actually one of at least four versions of the story made between 1914 and 1955. I haven't seen the other versions--though the 1914 silent movie version is posted on YouTube, so I'll get to it eventually. Even so, I'd be willing to bet up to $23.80 that the '42 version would still be my favorite. The tale is set in Nome, Alaska in 1900, during the height of the Gold Rush. John Wayne is Glennister, the co-owner of a big mine. 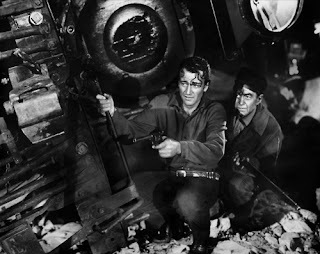 Randolph Scott is McNamara, the dishonest gold commissioner--he's in charge of filing claims on mines, but manipulates the records to gain ownership of rich strikes for himself. It's fun to see Scott--who played heroes through most of his career--doing an effective job of playing a suave but still physically imposing villain. 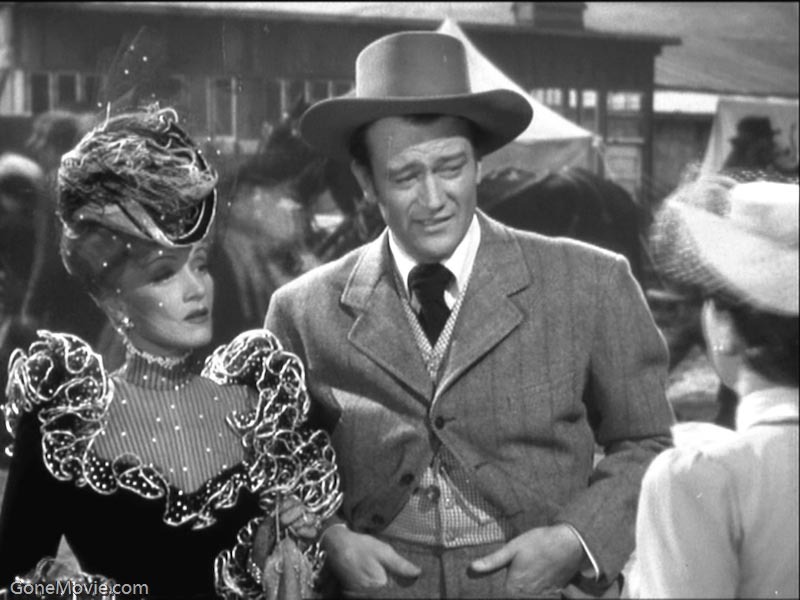 Marlene Dietrich rounds out the main cast--she's a saloon owner named Cherry Malotte who has a thing for Glennister. It's the sort of role of tough-gal role she was so adept at playing. She gorgeous and smart and gets to play an important role in eventually bringing down the bad guy. I love the look of the film as well. It might have been tempting to simply use an Old West set and tell us "This is Alaska." But though there is an Old West vibe (perfectly appropriate, as 1900 Alaska was still very much a frontier), the town gives us a real sense of being way up north. Little touches, such as the thick mud streets with an occasional path of two-by-fours laid across from one building to another, all add up to give the film a real sense of atmosphere. And--as is so delightfully typical of films of this era--the supporting characters are played by skilled character actors who bring real personality to even the minor characters. 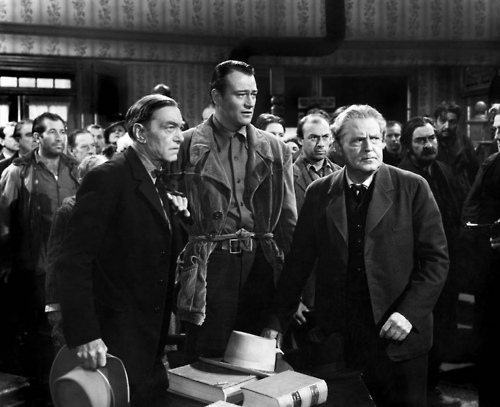 Harry Carey is perfect as Glennister's partner. Richard Barthelmess plays the Bronco Kid, a gambler who works for Cherry and is hopelessly in love with her. Bronco's story arc is background to the main plot, but it's a particularly interesting one that hits some strong emotional notes. 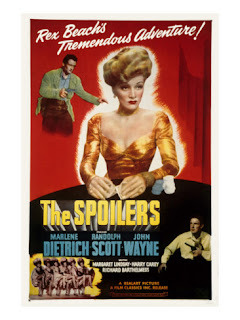 The same year they made The Spoilers, Wayne, Randolph and Miss Dietrich also starred in a movie called Pittsburgh, which also had a great Wayne/Scott fist fight. The two men went on to both have truly iconic careers, but I think they could have made good livings just beating the snot out of each other one film. They were awfully good at it. There is a horrible gap in my blog. Early on, I did post about Scrooge McDuck. That post, by the way, is cited as a footnote in the Hungarian-language Wikipedia entry on Uncle Scrooge. HA! I'm big in Hungary! How many of you can say that? But I don't think I've written about Carl Barks' Duck stories since then. I did review a Don Rosa Scrooge story a few years back, but nothing else about Carl Barks. 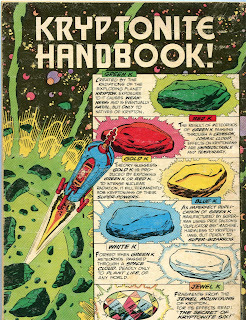 I've covered over a hundred Jack Kirby stories. I've covered several Sgt. Rock stories drawn by Russ Heath. But I've given the last of the three greatest comic book artists ever short shrift. That shall not stand. Barks was a wonderful writer as well as artist. His Duck stories (whether involving Scrooge or Donald) were completely different from superhero stories, of course. In fact, it's my understanding that Barks wasn't a fan of the superhero genre. But all the same, I think that Barks as a writer accomplished something very similar to what writers such as Edmond Hamilton or Otto Binder did in the superhero genre. He took the inherent logic of a world containing talking animals and slapstick humor, then used that logic to craft truly exciting adventure stories. Just as the writers working for Mort Weisinger took the various elements of Superman's universe and crafted internal logical stories out of that. What brings Barks' stories to the top of the heap in terms of quality was a combination of his skills as writer and as artist. His art is so much fun you often can't stop looking at it. Barks used his visuals to tell a well-constructed adventure story without ever sacrificing humor. He showed honest emotion---sometimes exuberantly and sometimes with amazing subtlety. His writing complemented this--humor combined with great characters and strong plots. It was an amazing balancing act--telling stories that meshed slapstick humor and funny animals with a sense of real danger and adventure. These elements always blended together perfectly, full of cleverness, wit and heart. 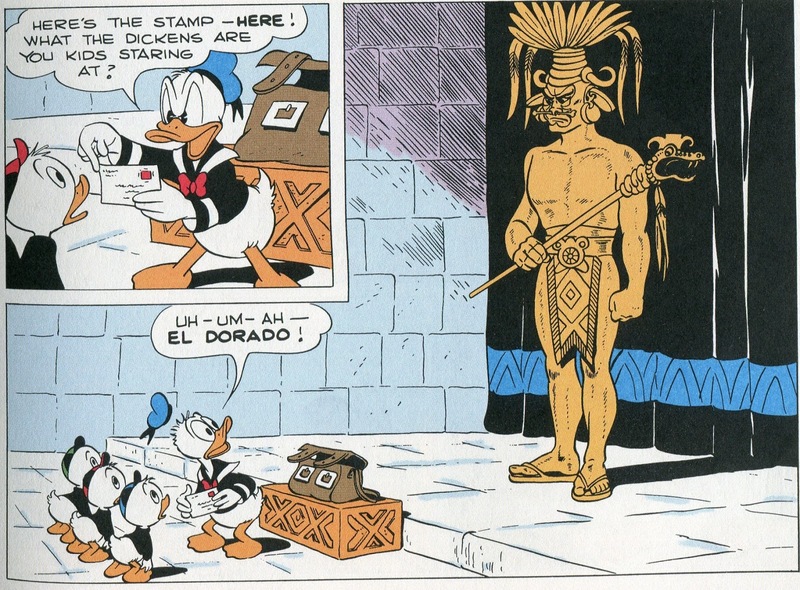 "Donald Duck and the Gilded Man" (Four Color #422--Sept/Oct 1952) is a great example of this. Donald has gotten into stamp collecting, hoping to make enough money to pay for a trip to British Guiana in hopes of finding a rare stamp worth $50,000. A summery of the story would make it sound like it meanders without a clear purpose. 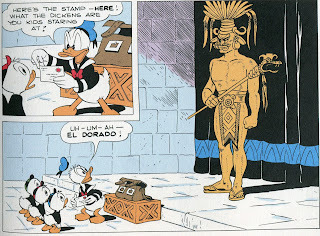 The action goes from Duckburg to South America and back to Duckburg, as Donald and the nephews trail a letter with the rare stamp on its envelope into an uncharted jungle, have a run-in with a lost tribe and a supposedly mythical giant, then chase the letter as it is forwarded through the U.S. mail to one address after another. The story bookends with encounters with Donald's impossibly lucky cousin Gladstone Gander. But it doesn't meander at all. It follows the logic of Donald's universe and everything that happens makes sense in that context. Gladstone's involvement at the beginning of the tale leads to Donald getting the money he needs to go to South America. The search for the stamp logically leads Donald and the nephews deep into the jungle. Their capture by the Gilded Man forces them to use their wits and whatever items they have at hand to escape. When something fortuitous happens to help them along, it doesn't seem contrived, but rather seems to be another perfectly logical part of the story. 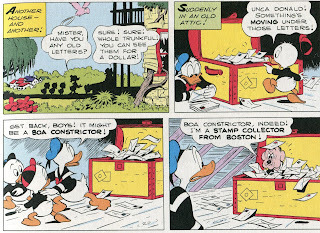 Like just about every story Carl Barks wrote, it is stuffed with so much pure fun that it leaves you with an almost uncontrollable urge to tell other people about it. A really effective background that makes the knight and soldiers in the foreground look even more awesome. I based the articles in part on the Review and Episode Guides I've previously published on these shows. The links below are for the Kindle versions, though you can also get them for the Nook HERE. Eve Arden and Gale Gordon (who plays Principal Conklin) were two of the funniest comedians ever and this episode is typical of the series in how well it used their talents to generate laughs. I was first introduced to Doctor Who through novelizations of the television episodes. The first one I read was a Tom Baker story--Genesis of the Daleks--which I bought at a Stars and Stripes bookstore in Subic Bay. When I got back to the States, Doctor Who was being broadcast in the U.S. on various PBS station. 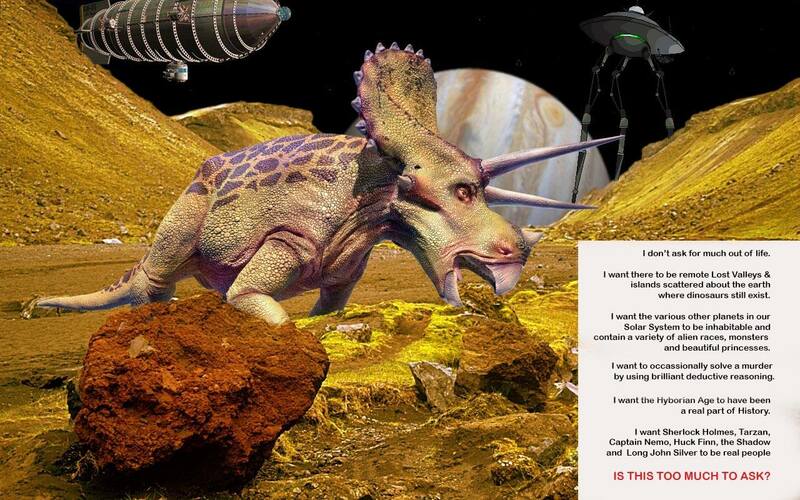 I'm pretty sure the first episodes I saw were from The Ark in Space, also a Tom Baker story. Baker will always be my Doctor, but all the various Doctors (from both the old-school and new-school episodes) have brought something entertaining to the part. And I was introduced to many of the early Doctors through the novelizations, which were available in the States long before the actual episodes were. So when some of those novelizations recently became available in electronic reprints, I snatched them up. With very few exceptions, the prose versions of the stories are well-written, fast-paced science fiction adventures that provide you with a perfect way to spend the 90 minutes to 2 hours it takes you to read one. Take Doctor Who and the Ice Warriors, for example. 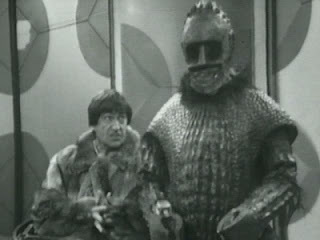 Written by Brian Hayles in 1975, it was based on a 1967 story arc that starred Patrick Troughton as the Doctor. Gee whiz, it's a lot of fun. The wandering Time Lord is, at this time, travelling with Jamie (a hotheaded young Scotsman from the 18th Century) and Victoria (a very pretty gal from the 19th Century who does tend to scream and faint a little too often for my tastes). The TARDIS plops them down near a scientific base in futuristic England, where that base is one of many using "Ionisers" to stave off a new Ice Age. Outside the base, England is now a snow- and ice-covered wilderness, with the glaciers slowly advancing despite the best efforts of Earth's scientists. But that's not their only problem. It turns out that 5,000 years or so earlier, a Martian ship crashed on Earth and was frozen during the original Ice Age. Now the crew of Martian Ice Warriors have thawed out and have decided that an unplanned delay of five millennia is no reason not to continue their efforts to conquer our world. This sets up the sort of "Last Stand" situation that Doctor Who has used any number of times, in which humans trapped in an isolated location are threatened by aliens. This time, it's a scientific base surrounded by glaciers. In other story arcs, the location has been a space station or a giant mobile mining complex or an undersea base. Well, this time around the aliens need to raid the base to replace their deteriorated fuel supply. The humans need to keep the Ioniser running, but doing so might cause the reactor on the alien ship to explode. The guy in charge of the humans is intelligent enough, but unwilling to make a decision unless the master computer approves a specific course of action. His best scientist has thrown a snit and gone to live in the wilderness with other "scavengers," which includes a guy who thinks he can negotiate with the Ice Warriors because he hates scientists. (Don't try to follow his logic in this--he's pretty much just nuts.) 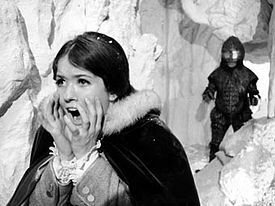 And Victoria has soon gotten herself captured by the Ice Warriors, because next to screaming and fainting, being kidnapped is what Victoria does best. This leaves the Doctor in a situation where, aside from rescuing Victoria, he has to gain the trust of the humans, help them get the Ioniser online before the base is crushed by glaciers and figure out how to stop apparently indestructible aliens. He manages to slap together a few scientific Macguffins that just might help him do the job. It's a great little novel. I just re-read it in one sitting and had a ball. I admit I never cared for Victoria as a companion, but she does manage to stop screaming long enough to be useful a few times, so I'll be forgiving. All other aspects of the story come together nicely--the danger generated by the Ice Warriors plays nicely off the tension that comes from the shortcomings of the various humans. As was usual for the original run of Doctor Who stories, you know that a few of the supporting characters are going to get killed, but you never know for sure which ones that will be. There aren't any obvious Red Shirts. In fact, one character death actually surprised me--it was someone I thought was being set up to play a larger part in the story. 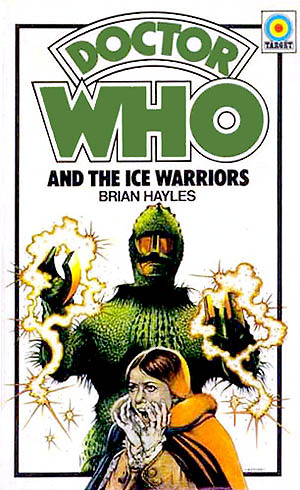 This was, by the way, the first appearance of the Ice Warriors. I always thought these guys were good visual designs and effective villains, but they seem to have largely faded away--overshadowed, perhaps, by Daleks and Cybermen. Well, one never knows. They may make a comeback someday. Tom Baker will always be my favorite Doctor, but I'd happily step into the TARDIS with pretty much any of them. Once upon a time, there was only green kryptonite. This is type that even those cursed to go through life as non-comic book geeks know about. 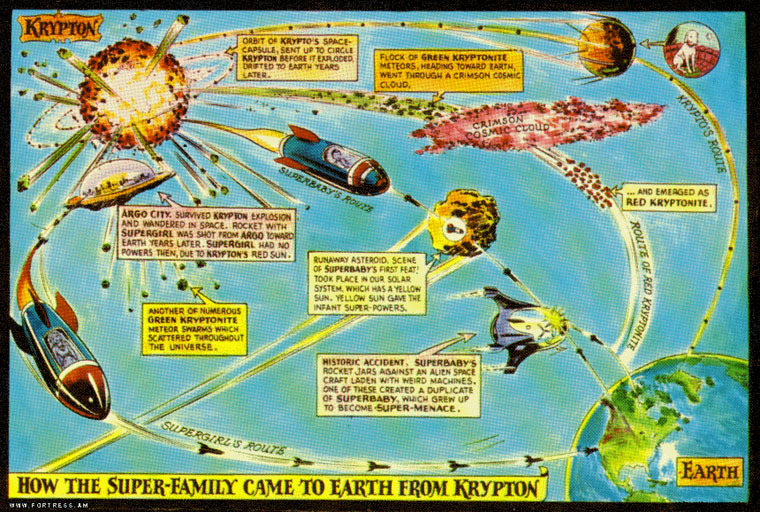 When the planet Krypton exploded, chunks of it were infused with a radiation deadly to anyone from that planet. When exposed to it, Superman (or Supergirl or Krypto or any other Krytonian) will grow weak and eventually die. 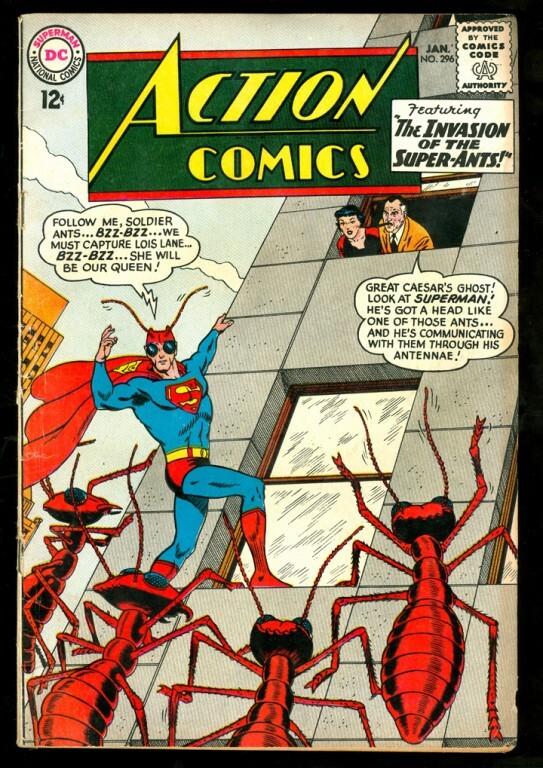 The first appearance of green K actually wasn't in the comics, but in the excellent 1940s The Adventures of Superman radio show. 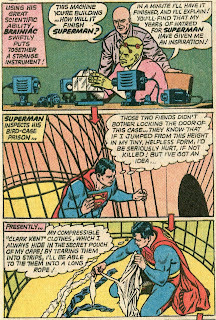 In that version of Superman's universe, kryptonite left him weak and helpless, but didn't actually kill him. 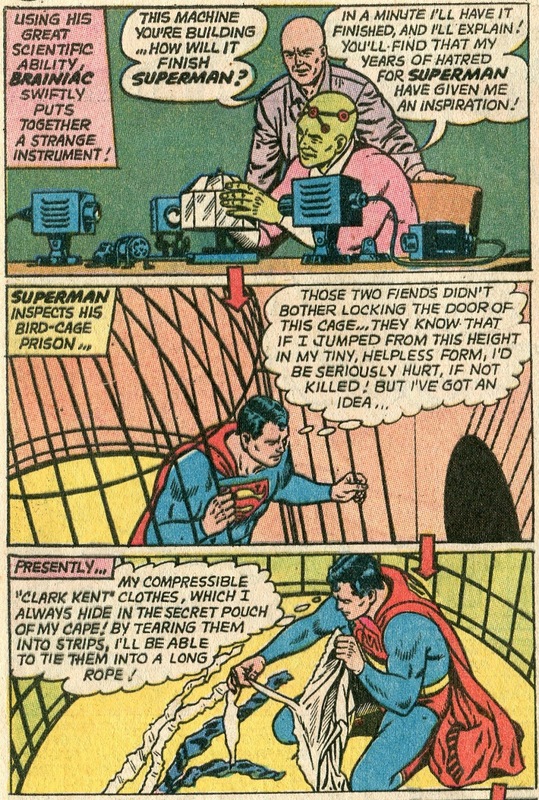 On at least two occasions, bad guys used green K to render the Man of Steel helpless, then kept him locked away with the intention of starving him to death. It was an effective storytelling ploy that served twin purposes. First, it made for an extended cliffhanger that could last for multiple episodes. Second, it gave actor Bud Collyer (the first actor to give Superman a voice) a chance for some time off. While Superman was in a kryptonite-induced coma, Collyer could take a vacation. Other characters--most notably Batman and Robin--would take over as lead hero until Superman escaped or was rescued. 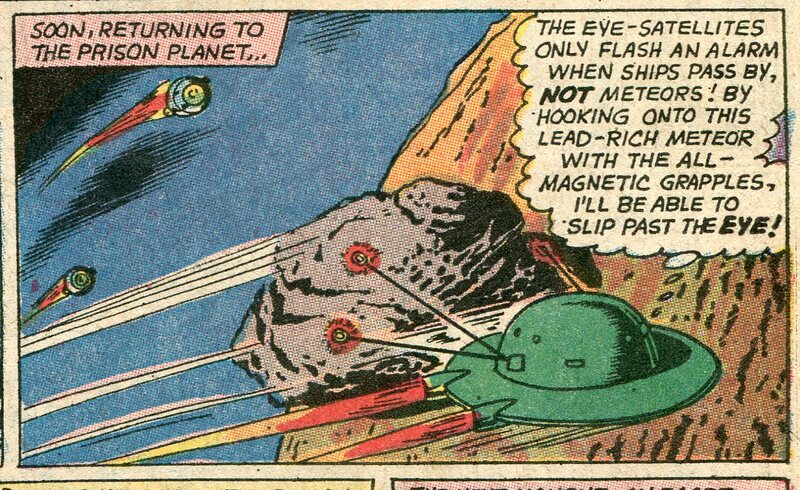 But Mort Weisinger wanted to have even more fun with kryptonite. So during the late 1950s and early 1960s, different colors of the element began popping up--each of which has a different effect on Kryptonians. The most famous of these is probably Red K, created when a swarm of Green K meteors passed through a strange cosmic cloud. Red K can be a fun storytelling device, or a silly storytelling device, or a just plain dumb storytelling device. This is because every time a Kryptonian is exposed to a specific chunk of it, it'll have a temporary but unpredictable effect that is completely different from other Red K chunks. It once turned Superman into a baby. On another occasion, it turned him into an old man. It's also turned him into a kryptonian dragon, made him fat and bald, given him amnesia, took away his invulnerability on the left half of his body, made him evil, created an evil twin, made his hair grow, turned him into a giant, and gave him the head of a ant. And that's only a partial list. With that much variety, it's no wonder Red K stories were so varied in their overall quality. Red K could be the Macguffin for a strong story--or it could be a crutch for telling a really bad story. Gold K is created when Green or Red K is exposed to certain types of radiation--it can then permanently take away a Kryptonian's powers. Blue K is created by zapping Green K with the same imperfect duplicator ray that created Bizarro Superman. If you have no idea what that means, be patient. We'll get to Bizarro. Anyway, Blue K is deadly to any Bizarro, whether he/she is a duplicate of a Kryptonian or a Earthman. Jewel K was artificially created by a Phantom Zone criminal--we'll take a look at this more closely in a future entry, when we talk about the Phantom Zone. White K was formed when yet another batch of Green K flew through a space cloud. That seems to happen a lot. White K kills all plant life. 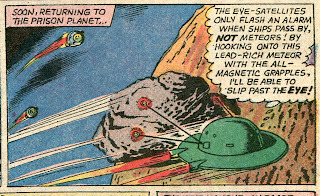 Supergirl once used it to stop some alien plants from overrunning Earth, but it's not something that writers--no matter how imaginative--are going to use very often. I'm not aware of more than two White K appearances during the Silver Age. I'm not going to review a specific story this time, since we'll be running into kryptonite several times in upcoming entries. Was kryptonite a good idea? Yes, it was--each type of the stuff contained potentially strong storytelling fodder. But I would also agree that it was often overused. There were times during the Silver Age when it seemed like every thief, thug and mugger had a chunk of Green K in his pocket. It was something that even great writers like Hamilton, Binder or Siegel would sometimes use as a crutch. These were imaginative men and I have unending respect for their collective ability to wrap the internal logic of Superman's universe into entertaining stories. 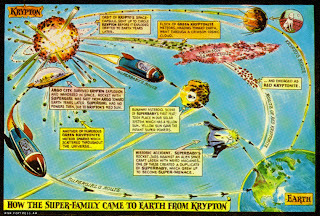 But they had to write an awful lot of stuff--it's not surprising that kryptonite became their quick "go-to" method for getting the Man of Steel in some sort of trouble. But at the same time, I wouldn't want to live in a world that didn't have a rainbow spectrum of kryptonite stories to choose from. So I guess I shouldn't complain. In a few weeks, we'll begin a series of posts on Superman's Rogue's Gallery. One would expect this would start out with a certain bald mad scientist, but he'll actually be second. Since we've already looked at Brainiac's first appearance when we covered the bottle city of Kandor, we'll begin with him. Though the story we'll be looking at does involve Lex as well, so hopefully this decision won't put me on Luthor's enemies list. You don't want to be on Luthor's enemies list. It would take up an awful lot of your time. Gee whiz, I leave my stuff lying on the floor all the time, but no one ever murdered me because of it! This is the sort of story that Dragnet did exceptionally well. A man comes into the police station to confess to murder, insisting he tell the story in his own way so that the cops will understand he had no choice and it wasn’t his fault. The police have to both get the full story from the guy AND try to find out if he's telling the truth. It’s just a coincidence, but I did a recent blog post about one of the original Conan stories in which dramatic tension was created by forcing deadly enemies to team up with one another. I decided to talk about other Robert E. Howard stories in which he used the same tension-generating method. I didn’t stop to think that I was being thematically consistent with my Read em in Order reviews, but I was. It’s probably my innate genius working on a sub-conscious level. Anyways, Last Laugh,Mr. Moto is the last of the pre-war Mr. Moto novels. 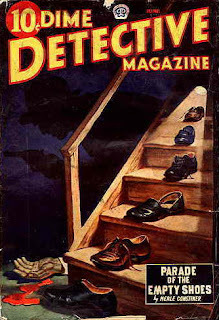 It was serialized in Colliers Magazine beginning in 1941, so even though it didn’t finish its initial serial run and then get collected in novel form until after Pearl Harbor, this story takes place when the United States was still at peace. The rest of the world, though, was at war. In fact, a French merchant ship—upon learning that France had fallen to the Nazis—stashed a plane it was carrying on a remote Caribbean island. The plane is important because it has a valuable new top-secret device installed on it. The ship is later sunk, so no one knows for certain where the plane is hidden. That’s what leads to a situation in which deadly enemies are forced to work together. The protagonist this time around is an ex-naval aviator named Bob Bolles. Like most of the protagonists in this series, he’s seen better days. He resigned his commission after being passed over for promotion. Now he bums around the Caribbean in a sail boat, drinking too much and rapidly running out of money. So when a married couple who claim to be from New York charter his boat for a trip to a remote island, he takes the job. But the couple isn’t from New York and isn’t really married. And their beefy Swedish servant isn’t Swedish. By the time Bob figures out what’s going on, they’ve reached the island. But competition to find the plane is waiting for them there in the form of Japanese agent Mr. Moto. This puts Bob in a rather precarious position. While the various spies decide whether to start killing each other or work together at least until they find the plane, it occurs to Bob that none of them really need HIM any longer. Gee whiz, author John Marquand really succeeds in cramming tension into this story until it seems about to burst at the seams. Bob has to convince the spies he’s not expendable. But he wants to do more than just survive. Like Casey Lee from No Hero, he abruptly discovers that he still wants to serve his country. That means he has to outsmart a gang of armed spies—including the unflappable Mr. Moto. 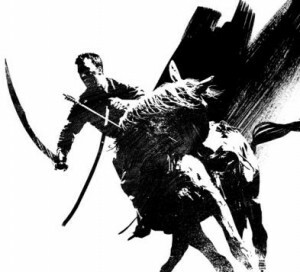 Like most of the Mr. Moto novels, there’s very little traditional action in terms of fights and chases. Here, the tension is built to extreme levels by the situation itself and by the dialogue, as the characters negotiate for temporary alliances and (in Bob’s case) look for excuses not to be killed outright. A scene near the climax, in which Bob plays a hand of bridge with the spies—knowing they are planning on killing him afterwards—is a particular nail-biter. Last Laugh, Mr. Moto gives the previous novel (Mr. Moto is so Sorry) a serious run for the money in my choice for the best of the series. Sorry edges it out only because the love story aspect of Last Laugh is a bit forced. But even taking that into account, both are extraordinary tales of suspense packed full of fascinating characters. That’s the last of the pre-war Moto novels. Though Mr. Moto is definitely one of the antagonists this time around, Marquand still manages to make him intelligent and likable despite his willingness to act ruthlessly to get his job done. Pearl Harbor would pretty much ruin the market for likable agents of the Japanese government. But Marquand would bring Moto back eventually. The last novel in the series was 1957’s Stopover Tokyo, about foiling a Communist plot to take over Japan. Moto will be older and perhaps a little bitter about the war, but he’ll get to end his career on the side of the angels. And it's been awhile since we've done a movie series as part of the Read/Watch 'em in Order series. I think we'll go through the Thin Man movies--since that gives me a chance to watch these films again. (Myrna Loy--yum!) We'll be doing another book series as well--I think we'll add some more science fiction to the mix and look at Otis Adelbert Kline's three Venus novels. 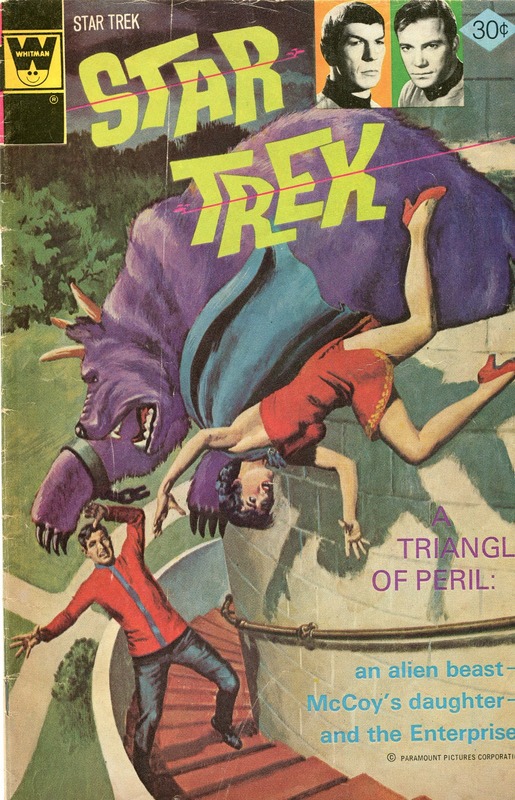 GOLD KEY TV ADAPTATIONS: "Voyage to the Bottom of the Sea," "I Spy," "The Man from Uncle," "Star Trek"
During the 1950s, Dell Comics often published books featuring characters licensed from movies, TV and radio. 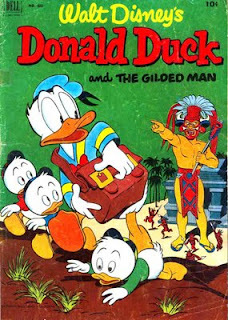 Their most successful books were those on the Disney characters, which were highlighted by Carl Barks' superb work on Donald Duck and Uncle Scrooge. Throughout that decade, while superhero comics were at a low ebb and made up just a small percentage of the books being published, Uncle Scrooge was regularly outselling Superman. Actually, the creative work was all being done by a company called Western Publishing. Barks and the other artists, as well as the editors, all worked directly for Western. Dell handled the printing/distribution end of things. 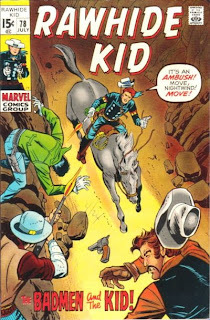 In the early 60s, Dell and Western had a falling out over financial issues and Western turned to Gold Key Comics for distribution. They kept doing a lot of adaptations from other media, as well as some original stuff such as Turok and Dr. Magnus. We looked at Turok several times in the past, so today we'll thumb through a few of their TV adaptations from the 1960s. Voyage to the Bottom of the Sea #10 (Nov. 1967): The Seaview is the third coolest looking fictional submarine ever designed. The submarine originated in a 1964 movie, but then moved to series television. 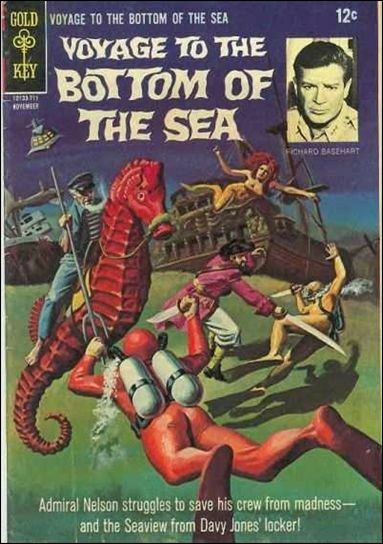 With Richard Basehart playing Seaview designer Admiral Nelson and David Hedison playing Captain Crane, the submarine encountered sea monsters, aliens, wax dummies come to life and other bizarre threats on a weekly basis. In this comic book adventure, they dive down to the bottom of the Marianas Trench--the deepest spot in the ocean. Once there, they encounter Davy Jones. 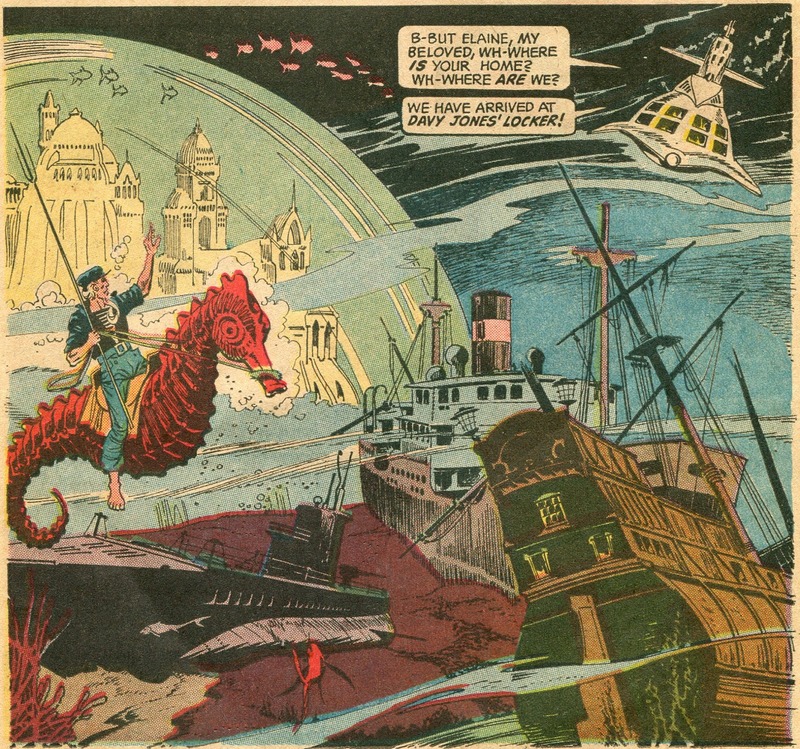 This version of Davy is an elderly guy in 19th Century sailor's garb, riding a giant sea horse. He has a mermaid/siren creature hypnotize the bridge crew and plans to add the Seaview to his collection of ships littering the local seascape. Admiral Nelson and another character manage to avoid the hypnotism, fight Blackbeard and the crew of a Spanish galleon, rescue the bridge crew and make a getaway. 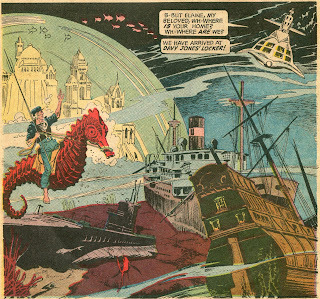 It's a fun story with some nice imagery--the view of shipwrecks from different eras surrounding Jones' undersea city is particularly effective. But it's marred by a silly plot hole. Nelson and his ally avoid the Siren's hypnotic call by plugging up their ears, yet they can still hear each other speak. Huh? There's also a somewhat weak "It was all a dream!--or was it?" ending. 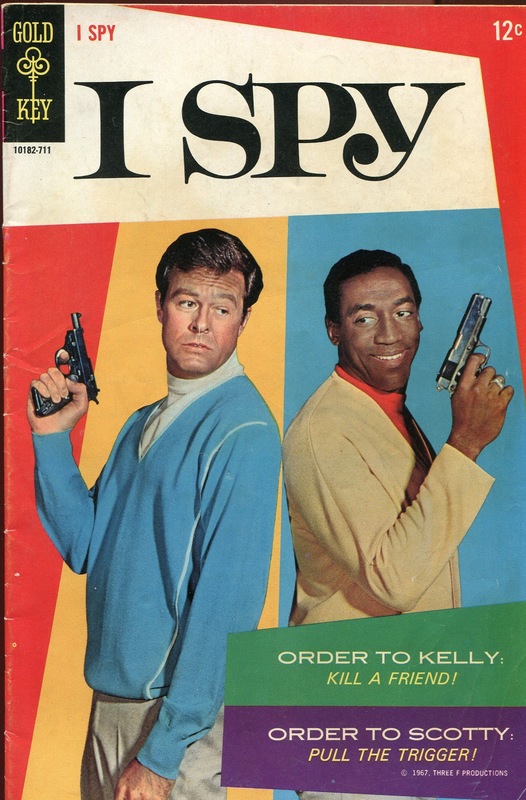 I Spy #3 (1967): Robert Culp and Bill Cosby played two urbane and witty spies in this 1960s adventure series. This comic story, in which Culp's character is ordered to assassinate an old friend who is supposedly trying to defect, doesn't capture the witty dialogue of the show. But it still tells a strongly plotted spy story with several nice twists and a short but well-choreographed gun fight at the climax. It's good, solid storytelling and a fun read. The Man from Uncle #19 (July 1068): Somewhere in central Europe, there's a small kingdom that still maintains medieval technology and customs. An evil THRUSH agent, learning that the kingdom is a source of valuable rocket fuel ore, schemes to become prime minister. 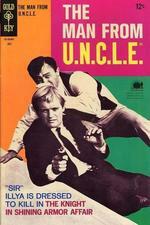 Napoleon Solo and Illya Kuryakin, posing as traveling minstrels, try to stop him. Illya ends up in a duel with the kingdom's champion knight, but manages to pull out a win by wiring his sword to his miniature radio and shocking his opponent unconscious. As with "I Spy," the comic fails to catch the tongue-in-cheek aspect of the TV show, but still tells a fairly solid story. 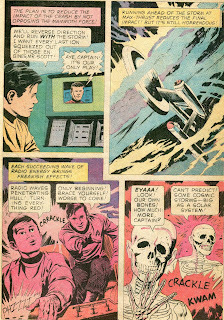 Star Trek #40 (July 1976): After being damaged in a cosmic storm, the Enterprise returns to Earth for repairs. There, Kirk meets Dr. McCoy's daughter, a Xeno-zoologist who dislikes Star Fleet because she blames it for breaking up her parents' marriage. From here, two plot threads fan out in different directions, then come together again at the climax. One plot involves a creature that can telepathically relay thoughts from one person to another. The second plot involves an ex-crewman who hates Kirk and plans to destroy the Enterprise while it’s in space dock. The eventual linking of the two plots is a little contrived, but overall the story is good. 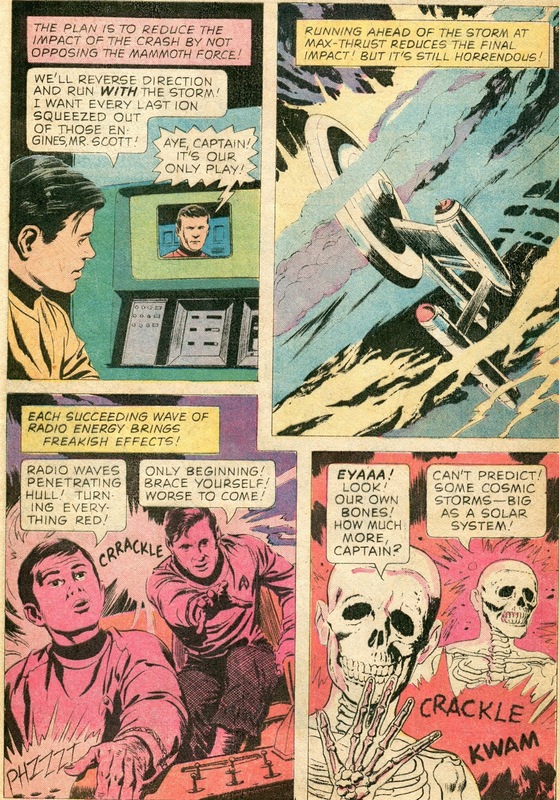 The artist made poor Dr. McCoy look like a white Chubby Checker, but his ship, monster and building designs are fun. The opening sequence, with the starship trying to weather the violent cosmic storm, is particularly good. Overall, none of these tales are truly great, but they represent sincere attempts--usually successful--of telling entertaining, unpretentious stories outside the superhero medium. I like the perspective in this cover. A supposed killer horse known as White Fury is roaming the countryside and has apparently killed at least one man. But Wild Bill isn’t so sure the horse is guilty. A month or so ago, I wrote about a Conan novella--The People of the Black Circle--in which one of the fun aspects of the story was Conan being forced to team up with an enemy. The two men had to work together until they achieved a specific goal, then they would go back to trying to kill one another. This got me thinking about other stories in which Robert E. Howard used this plot device. He did it on one other occasion with Conan and once with 20th Century adventurer El Borak. We'll take a look at these stories eventually. Today, we'll look at "Trail of the Blood-Stained God," which recounts an adventure of yet another 20th Century adventurer wandering around the Middle East. This is Kirby O'Donnell, an Irish-American brawler who--when the story first opens--is looking for a stolen treasure map in a dark alley located in a Mid-Eastern city. This leads into a fast-moving and exuberant adventure yarn. 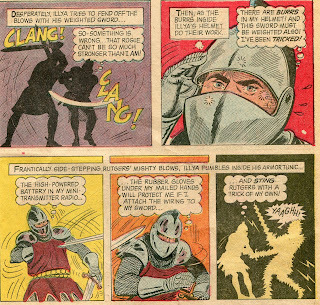 Kirby is almost immediately involved in a fight against half-a-dozen opponents--not realizing he's actually fighting the map thieves while he's trying to rescue a man from being tortured. This is the first of several truly exciting fight scenes that Howard manages to fit comfortably and realistically into this fairly short story. Soon after that, he teams up with a Persian named Hassan, who also knows about the map. Kirby knows Hassan will probably back-stab him after they find the treasure, but for now the two men need each other. The thieves have left the city, so the erstwhile partners pursue. Soon after THAT, O'Donnell and Hassan find themselves trapped between the map thieves (led by an English renegade named Hawklin) and some local savage tribesmen. Outnumbered, Hawklin allows O'Donnell and Hassan to join him--leading to another great fight scene as the tribesmen try to overwhelm the small force. Later, with Hawklin now the only survivor of his group, he, Kirby and Hassan go after the treasure--each of them knowing that their alliance will only last as long as it takes to find it. Howard calls it an alliance of wolves--three skilled warriors who work together to survive and gain loot, then will without question try to carve each other up afterwards. This very bare bones summary doesn't do justice to the story at all. Aside from the great action, it is a model of solid story construction--with one event leading logically into the next. I didn't get to read this story in its original form until just a few years ago, when it was included in a Howard anthology. When I was a little one, I had read an L. Sprague de Camp re-write of the story that was included in the old Lancer paperbacks that anthologized the Conan stories. de Camp's Conan pastiches generate a lot of strong emotion among REH fans. I myself don't hate them vehemently, but I don't think they're all that good. My opinion of de Camp is that he was an excellent writer, but with a prose style and a world-view that left him unqualified to write good Conan stories. His original Conan novels--such as Conan and the Spider God and Conan the Liberator--are actually quite dull. The Conan version of "Bloodstained God" is probably the closest thing to a good Conan pastiche that de Camp did. This is in part because the story is so straightforward and in part because there was an opportunity to insert a supernatural element without it seeming contrived--a major drawback with other non-Conan stories that de Camp changed to fit into the Hyborian Age. It (the Conan version) was also adapted into a comics story in 1977--with John Buscema's art work making it look too cool for words. But the original REH story has an exuberance and a love of pure adventure to it that de Camp managed to lose when he re-wrote it. This shows through especially in the ending--de Camp's climax is a little depressing, while Howard's ending looked forward to more adventure, as well as tying the events of the whole story together more solidly. Howard only wrote a few Kirby O'Donnell tales, but the Irish-American was a fun character with a real love of life that give his tales a unique ambiance. I wish we'd seen more of him. 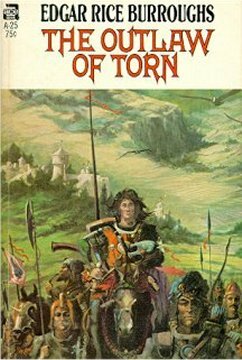 "Trail of the Blood-Stained God" didn't sell during Howard's lifetime, but it's a wonderful adventure yarn. "If we're going to kill someone, it's got to be someone very important"
As we end our chronological look at the early Marvel superhero books, we're going against precedent in several ways. First, we're jumping ahead a couple of years--past a time of merely average stories to the point where the creative staff at Marvel realized they needed to do something to shake up Amazing Spider Man before it became stagnant. Also, I've generally done little or no research before doing the chronological reviews, since I wanted to be able to write about the stories as is--and not be swayed by any knowledge of the creative process behind it. Not that discussing that process isn't interesting and worthwhile--it simply wasn't the purpose of this series. But this time out, I'm going to be talking about the creative process. This is because it's both particularly interesting AND--font of never-ending knowledge that I am--I already know quite a bit about it. That's in part because I ran across references to this story arc a couple of years ago, when I was preparing a lecture I was giving to a History of Illustration class. The lecture would be about Milt Caniff, writer and artist of the best adventure comic strip ever--Terry and the Pirates. In a 1941 story line, Caniff killed off a sympathetic major character named Raven Sherman. John Romita Sr, who would grow up to draw Spider Man, was ten years old at the time. He remembered not just the impact that death had on him as a kid, but that all the grown-ups were talking about it as well. He was struck by how much Raven's death meant to everyone. So when editor Roy Thomas, writer Gerry Conway and Romita were talking about who to whack, Romita remembers pointing out that "If we're going to kill someone, it's got to be someone important. You can't kill minor characters and get any kind of reaction." So who to kill? Poor Gwen quickly moved to the top of the list. As the decades passed and those involved were asked about the decision, memories sometimes became a little fuzzy. Certainly the fact that Gwen was constantly overshadowed by the vivacious Mary Jane was a factor. The most commonly stated reason, though, seems to be that Conway, Romita and Thomas simply didn't know what to do with Gwen. 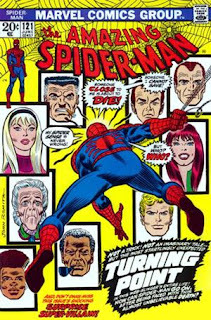 Peter was still too young (in comic book time) to get married and the creative staff didn't want to deal with the storytelling problems a married Spider Man would bring them. 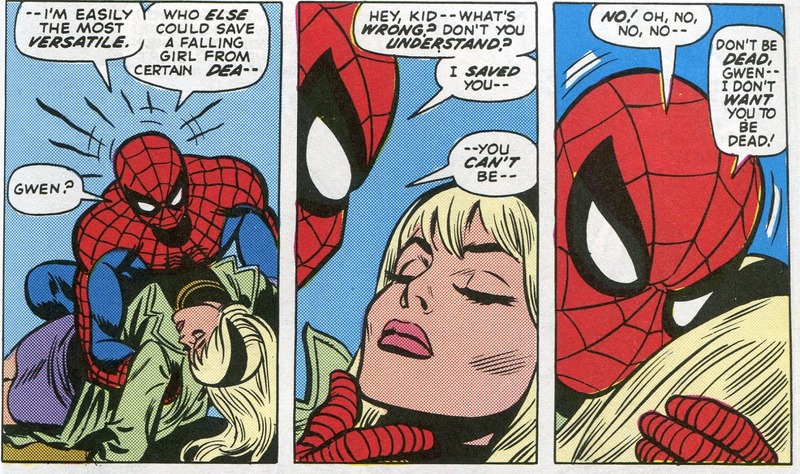 Thus, Gwen Stacy's death warrant was signed. The two-part story that evolved out of all that is quite excellent. Norman Osborne becomes the Green Goblin again and at the same time blames Peter for Harry's ongoing drug problems. 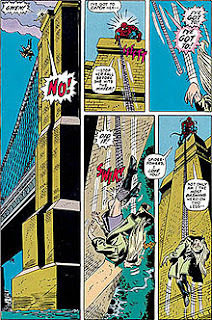 He kidnaps Gwen and takes her to the top of the Brooklyn Bridge. (This was incorrectly identified as the George Washington Bridge in a caption from the original printing.) There is a fight and Gwen gets knocked off the top of the bridge. Spidey webs her before she hits bottom and hauls her back up. But it's too late--she's already dead. We probably oughta talk about the exact cause of Gwen's death--this is a source of some fan controversy because there's that gosh-darn "SNAP!" sound effect when Peter webs her. A few panels later, Goblin is gloating that a fall from that height will kill someone whether or not they hit bottom, but the SNAP implies that the whiplash of stopping when Peter webs her has broken her neck. A few issues later, Roy Thomas confirms this in the letter column: "...it saddens us to have to say that the whiplash effect she underwent when Spidey's webbing stopped her so suddenly was, in fact, what killed her. In short, it was impossible for Peter to save her. He couldn't have swung down in time; the action he did take resulted in her death; if he had done nothing, she still would certainly have perished. There was no way out." But then some reprints have left out the SNAP. And comic writers/editors can retcon events in a heartbeat. So who the heck knows? It really doesn't change the emotions inherent in the story, though. Peter had no choice but to web her as she would have died for sure anyways. It's clear that the Green Goblin is morally responsible for her death. It's all done with incredible skill in terms of both writing and visual storytelling, hitting all the right emotional notes. It's a classic story not just because something important happens, but also because it's superb drama. Peter's reaction--his disbelief that Gwen can be dead because he had obviously just saved her--can't help but tug at your heart. 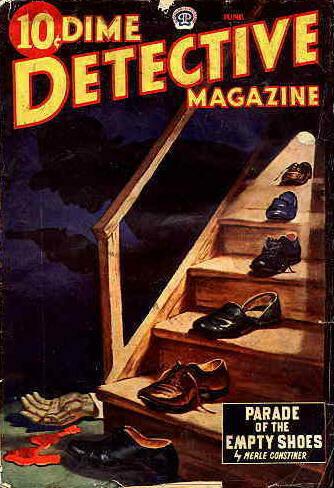 That's the first issue. 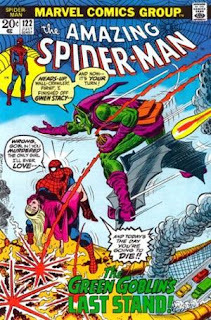 In the next, Spider Man tracks down Goblin and beats the snot out of him. Peter comes within his eye-teeth of killing Osborne, but it's not in him to do that. But Goblin ends up accidentally offing himself when he tries one more time to kill Peter. It's the last page of this story that--more than any other moment--makes this story arc a true classic. Mary Jane comes to Peter to comfort him. He snaps at her, essentially telling her she's a shallow party girl who isn't capable of feeling grief over anything. He tells her to leave. 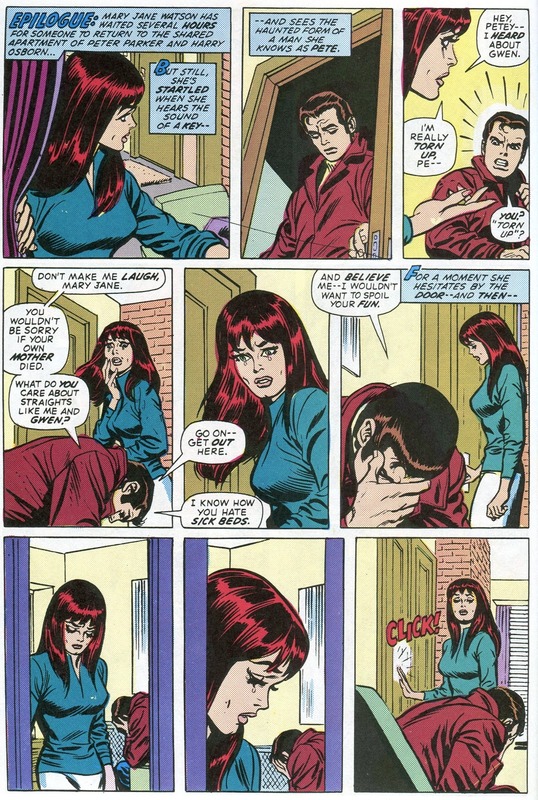 That very last panel, where she decides to stay, glues the entire story together and helps elevate Mary Jane to a person with depth--someone we can really accept at Peter's eventual wife. It'll take them over another 14 years of real-world time to get there,when the characters had matured enough to make the idea of marriage more acceptable. Even so fans can legitimately debate whether marrying Peter off to anyone was a good idea. (Though I say that without in any way justifying or excusing the offensively bad idea known as "One More Day.") But the idea that Peter and Mary Jane could one day fall in love with each other became perfectly believable at that exact moment. And this officially ends our chronological look at Marvel. I've enjoyed doing it, but I'm really looking forward to being able to jump around the various comic book universes on a more random basis. As I said a few weeks ago, I appreciate the fact that I have regular readers and I hope that any of you who come to this blog primarily for the Marvel chronological reviews will stick with me. Remember, life without a regular dose of my brilliant insights is really not a life worth living.